India Steps Up Alert Amid Heightened Tensions With China : The Two-Way The neighbors have been in a weeks-long dispute over Chinese road construction in the disputed region of Doklam. The plateau is claimed both by China and India's tiny ally, Bhutan. 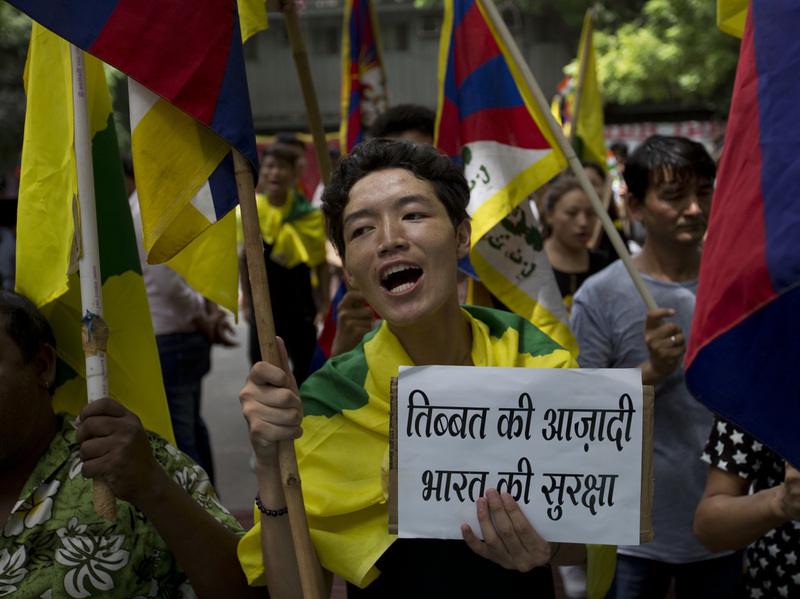 Exiled Tibetans shout slogans during a protest to show support for India on the Doklam standoff in New Delhi, India, on Friday. India has increased a military alert along its eastern border with China, moving troops and weapons into the region amid a weeks-long standoff between the two countries that shows no signs of resolution. As NPR's Julie McCarthy reported last month, New Delhi and Beijing have been at odds over a strategic region called the Doklam Plateau, which is claimed both by China and by India's tiny ally, Bhutan. In June, China began construction to extend a road there in an apparent effort to press its claim. In response, India sent troops as a show of force, sparking anger from China which says the affair is none of its business. Beijing demanded that Indian forces withdrawal, but Indian Prime Minister Narendra Modi has refused. India's Defense Minister Arun Jaitley told parliament this week that the country's armed forces are "fully prepared" in the event of conflict with China. Meanwhile, Reuters reports that Indian troops in Sikkim, south of Doklam, have been put on heightened alert, although the news agency quoted an unnamed source as saying it was "out of caution." In 1962, India and China fought a bloody month-long border war. The neighbors also have a continuing dispute over the sovereignty of Aksai Chin, a Himalayan region on their extreme western border. Doklam is strategically close to a sliver of land called the "Chicken's Neck" that is India's only land corridor to its frequently restive northeast. The two countries have also long been at odds over India's hosting of Tibet's government-in-exile and their spiritual leader, the Dalai Lama, considered by China to be subversive.